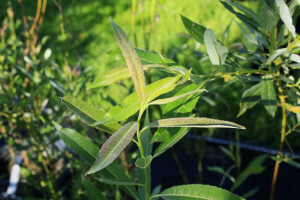 A fast growing willow that does well in lowlands, wetland edges, moist meadows and fields. Once established it will become drought tolerant. Plant is dioecious meaning male and female are separate plants. Attracts pollinators. Important food source for pollinators early in the season.